Simplecoding is a Techno label based in Buenos aires, Argentina. Our mision is to deliver young producers with one thing in common, great music. We believe in techno as a global language, a way to comunicate, a simple code used for expressing. Italy is well known by its electronic music culture. In Matera, few hours south from Bari lives Paolo Festa, whos business consultant skills get darken by night transforming in to synthetic rhythms. Best know as Twistedbrain74 delivers his debut ep on Simplecoding with his raw approach on techno. ‚DIGITOY‚ comes with 3 original tracks full of bouncing drums, rolling hats and synthetic melodies for all tastes. 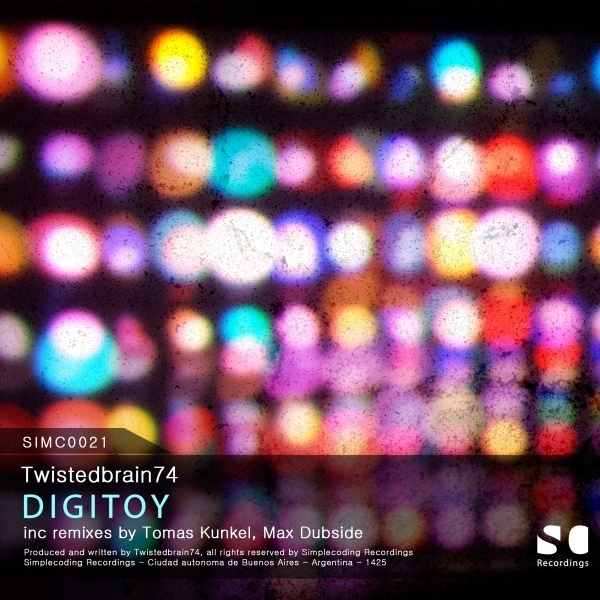 Also a couple of remixes from argentinian artists like last year’s remix winner Max Dubside and the well known Tomas Kunkel.